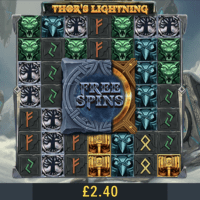 Award-winning slots and software provider Red Tiger Gaming has struck again with its latest release, Thor’s Lightning. The 7×7 title, set in the frozen wastes of Norse mythology, debuts with Nordic-facing operator Betsson before being distributed across the network on February 14th. It is Red Tiger’s opening ‘portrait-first’ slot, allowing for an enhanced player experience on mobile devices.